Giardia in dogs is a intestinal infection that causes much physical distress for the dog. Unfortunately it can be passed on from one dog to another and even to humans. Giardia can be very hard to detect and even harder to get rid of. It is a waterborne parasitic protozoa. It is not a worm. Protozoa? What is that? Protozoa are single celled organisms. These parasites are commonly found in the intestines of many animals, including dogs. They are flagellates. Flagellates have hair like tendrils hanging down that act as legs to help them move and ' swim '. Giardia is very difficult to detect in stool samples. These microscopic parasites cling to the surface of the intestine. They can also float free in the mucous lining of the intestine. These parasites can cause inflammation in the intestine. This inflammation can cause extreme digestive upset and diarrhea that can result in severe nutrient loss. I would be a rich woman if I had a dollar for every person who has contacted me to say that their dog has recurring diarrhea. Often giardia has gone undetected for a long time. When it is finally diagnosed, the infection is severe and damage has been done to the intestinal wall. Next to skin problems, diarrhea in dogs is the most common complaint and is often due to the giardia protozoa. It is important to know that humans can be infected by giardia too. So make sure you wash your hands. Giardia is easily spread from dog to dog, and is common in puppies born to mothers who have this annoying parasite. If a dog does not have a strong immune system, it will be unable to resist the infection. The severity of the infection depends on the overall health of the dog. Healthy dogs are able to naturally control the presence of giardia in the intestinal environment. In North America, infection of giardia in dogs is reported to be about 8%. The rate of infection in puppies is much higher at about 36% to 50%. Dogs in shelters and kennels are very much more at risk. Giardia in dogs in confined enclosed environments can be as high as 100%. a feeding stage that lives and moves in the intestines. eating the poop of another infected animal or something else that is contaminated with the cysts. drinking contaminated outdoor water from ponds, birdbaths, puddles etc. If you have a well, get it tested. Once your dog has ingested the cysts, they now have the opportunity to travel through the digestive system and break open in the intestines. There they feed and multiply. Those little things that look like eyes ( see pic above ), are actually nuclei. 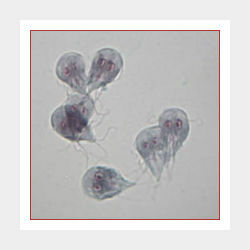 The Giardia protozoa multiplies by dividing in two, thus the two nuclei. Pretty clever little parasites! eating normally but still losing weight. Some experts see excessive grass eating as a symptom, because eating grass will often make a dog purge, either by vomiting or by prompting stool elimination. Some experts point to stool eating ( copraphagia ) as a symptom of giardia in dogs because the infected dog will attempt to regain nutrients and bacteria lost through diarrhea. Stage 1 or 2 must be found in the feces. Three ( 3 ) stool samples should be taken over a period of ten days to two weeks. The reason for this, is that the cysts are passed periodically, not with every bowel movement. Just because you receive a negative result, does not rule out that your dog may have this parasitic infection. Trust me, I know about this! Jack recovered from giardia in dogs and passed over the Rainbow Bridge, giardia free at almost 20 years of age. Love you Jack! 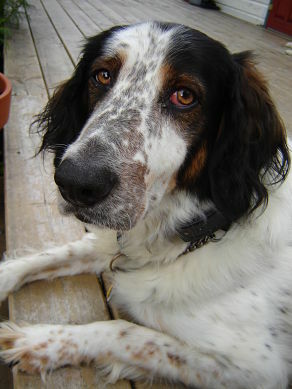 Here's my dog Jack, who actually had giardia for the first seven years of his life. He would show symptoms on and off, but my vet was never able to pinpoint this problem. Jack couldn't gain weight. He would have runny, loose, smelly, mucousy, sometimes bloody diarrhea and uncontrollable bowel movements with occasional vomiting. This went on for years. You can imagine how much I worried about him, but no positive results for giardia were found until many years later. Finally, giardia was diagnosed, but Jack did not respond to treatment. The most commonly used drug is Metronidazole ( Flagyl ) which is an anti biotic/anti protozoal. This drug can be used alone, or in combination with other drugs such as Panacur. Often the drugs used to treat giardia in dogs are not effective and have the potential to cause liver damage as well as other dangerous and unpleasant side effects. 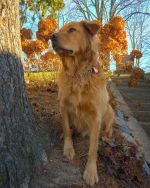 Since conventional medications have so many side effects, and are not really that effective for this problem, natural remedies are a good alternative for giardia in dogs, but will take longer. Here is what I used for Jack. It worked for him. After he recovered I still gave him this program once a year as a preventative just to make sure, because I know that giardia can reappear again. Liquid Silver Shield - #4280 - a powerful natural antibacterial that can replace antibiotics. Probiotic Eleven - #1510 - eleven different strains of beneficial bacteria to repopulate the gut with friendly bacteria. This makes the intestinal environment hostile to parasites by making the immune system strong. My dogs take this everyday on an empty stomach. It's their treat! If your dog is very sick and will not take capsules in food you can use Black Walnut Extract - #1755 instead. Dosage is three drops per 25 lbs of body weight. Since Giardia can cause severe intestinal inflammation, I like Aloe Vera Whole Leaf Juice - #1693 to soothe and heal the entire digestive tract. If your dog is so sick that he will not eat, and has diarrhea if he even looks at food, you can put all of these liquids together and syringe them down the dogs' throat. A syringe can be gotten at any pharmacy. Sometimes this is necessary. I would be happy to coach you through this process if you are experiencing these symptoms with your dog. For more help you can contact me here. 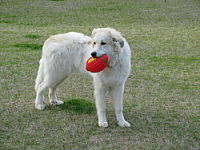 Hoss is a Great Pyrenes dog who suffered from Giardia. No more! Order Products for Giardia in Dogs here. To order simply type the product name and/or the stock # into the search bar and you will be directed.